In a seven-game playoff series, it’s almost as important to enjoy a strong start as it is to finish well. Just ask defencemen Jake Muzzin and Ron Hainsey as well as head coach Mike Babcock, the three members of the Toronto Maple Leafs who own Stanley Cup rings. But all the Maple Leafs knew the importance of a strong start. They fell behind 1-0 in their series against the Washington Capitals two years ago and were promptly dispatched in six games. Last year, the Bruins skated out to a 2-0 lead and even though Toronto battled back to tie the series at 3-3, Boston prevailed with a dominant third period in the deciding game. That made for a long 351 days before the Maple Leafs could get another post-season shot at the Bruins. Toronto made the most of its long wait. Babcock could not have asked for a better start from his club in its near-perfect 4-1 win in Beantown against the Boston Bruins on Thursday evening to make the road team the winner in four of the first six games of these Stanley Cup playoffs. 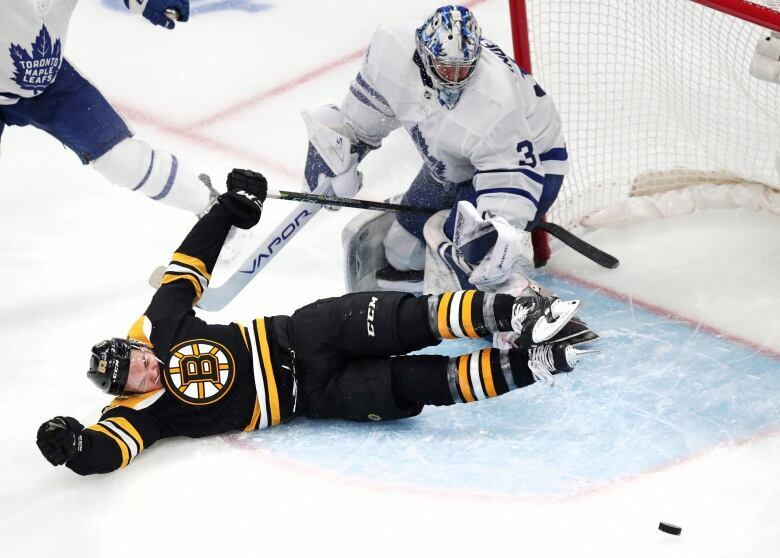 The Maple Leafs out-played, out-hustled and — surprise, surprise — out-hit their Original-Six rivals in their own building, where the Bruins had the second-best home record in the regular season behind the Presidents’ Trophy-winning Tampa Bay Lightning. After surrendering a Patrice Bergeron power-play goal midway through the first period, the Maple Leafs stayed patient and slowly took over the game. There were hiccups. But when Babcock’s side stumbled, as they did in the middle part of the second period, goalie Frederik Andersen bailed out his mates. He made 21 of his 37 saves in the middle frame. Toronto tied the game late in the first period on a Mitch Marner rebound. He gave the Maple Leafs the lead on a short-handed penalty shot early in the second period. The Bruins finished the regular season with 65 power-play goals, third in the league. But they also surrendered 15 short-handed goals, tied with the Pittsburgh Penguins for the most. The nifty Marner was able to exploit this area when he was hauled down on his short-handed breakaway by Boston’s Jake DeBrusk, resulting in a penalty shot. William Nylander extended the advantage to two goals late in the second period. There were so many positives in this outing for the Maple Leafs, possibly their best game this season. ♦ Muzzin, whose 51 career post-season games is second to Patrick Marleau’s 185 on the Maple Leafs, and his defence partner Nikita Zaitsev were able to shut down the Bruins top line of Bergeron, Brad Marchand and David Pastrnak. This trio combined for 20 points in the first two games of the series a year ago. They were ineffective in five-on-five situations in Game 1. ♦ The fourth line of Connor Brown, Trevor Moore and Frederik Gauthier had an excellent game. One of the strengths of the Bruins attack is the mistake-free hockey they receive from their fourth line. Well, the Maple Leafs had that in the series opener. ♦ John Tavares won 16 of 26 faceoffs, including a late-game draw against Bergeron which led to an empty-net goal from Tavares to quash any thoughts of a late-game comeback by the Bruins. ♦ Babcock finally exhibited enough faith in Auston Matthews. He led all Toronto forwards in ice time at 20 minutes, 42 seconds. ♦ Andersen shook off a season-ending slump with a strong game. This is a series that pits the Maple Leafs’ blazing speed against the tenaciousness and physicality of the Bruins. Boston’s physical game was missing in action on Thursday. The Maple Leafs know the Bruins will be better in Game 2 in Boston on Saturday. All the more important Toronto started the series in fine form. Now the Maple Leafs can work on their finish.